It can be very difficult going through life with several missing teeth. Simple tasks such as talking and eating can become uncomfortable, and they can make people feel very self-conscious. Furthermore, patients who are not able to eat the healthy foods they need tend to have a much shorter life expectancy. You may be asking, “How can the dentist near me in Leawood help?” Dentures from Dr. Dennis Ayer can replace your missing teeth so you can feel confident and function normally once again. Why Choose Dr. Dennis Ayer for Dentures & Partials? 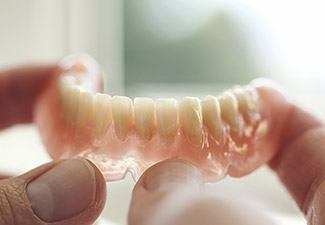 Dentures use prosthetic teeth attached to an acrylic gum-colored base to replace a portion or entire set of teeth. Partial dentures fit among your remaining natural teeth in order to fill in the gaps. This allows us to preserve your teeth without needing to modify them. As the name suggests, a full set of dentures is used to replace an entire arch of teeth. 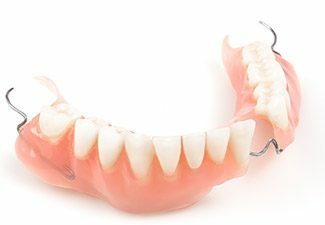 Dentures can be held in place using natural suction, metal clasps, or dental implants. The fit and look of your dentures will depend completely on what best suits your needs. The goal is to give you a set of teeth that is both natural looking and practical. 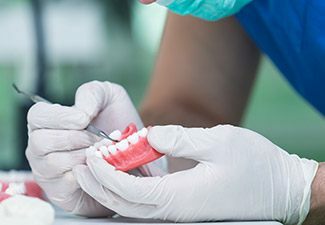 The first step to getting dentures in Leawood is to visit Dr. Ayer so he can evaluate your teeth and mouth to see if dentures are the best solution for you. If they are, his team will begin the process by taking several x-rays and scans of your mouth and jaw. This information will be used to create a series of wax models that you will try on in order to find your preferred look and feel. Once you have decided on the fit and appearance that works best for you, the last model will be used to cast your actual dentures. Further adjustments can be made even after you have your final set. The entire process usually takes multiple visits over the course of a few weeks. After you have gotten your dentures, you will be advised to wear them for 24 hours a day for a few weeks so your soft tissue can adapt to them. A small amount of denture adhesive may be necessary to secure them, but the fit shouldn’t depend on it. Talking and eating will not feel natural at first, but will after a few weeks of using your dentures. Practice reading out loud and try to eat softer foods to help this process go faster. Eventually, they will feel like you’ve always had them. 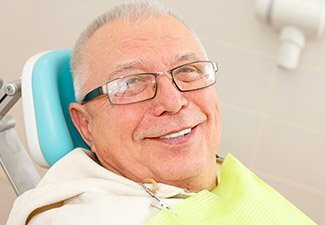 Your dentures need to be cleaned and maintained much like your natural teeth. You should brush and soak them every day, and Dr. Ayer can give you recommendations on which products will work best. You don’t need to let your missing teeth hold you back anymore and cause you problems. The solution is waiting for you with your dentist in Leawood. If you are curious about how a set of dentures could help you, please make an appointment with us today.